Multiple Issues, starting to get extremely frustrated with this printer! Posted January 11, 2014 · Multiple Issues, starting to get extremely frustrated with this printer! I've had this UM2 for about a month now and I have spent more time fixing problems than actually printing. The Bowden tube was moving up and down where it is supposed to be secured into the hot-end. Some prints look fantastic once they start and 5-6 hours in they completely fail or something happens to where I have to abort the print. A couple of times the nozzle spit out pure liquid blobs of plastic all over the print without changing the temperature. I've had multiple clogs in the Teflon fitting and nozzle, which could only be unclogged by taking everything apart. (I have become quite efficient at doing this). My extruder seems to eat up the filament at random times. I haven't been printing with crazy settings. I'm sorry that you've been having so many problems; I know how frustrating it can be, because my own printer came with some issues when I first got it, and I it definitely takes the shine off the ownership experience. I'm glad you could get those things sorted out initially. Those initial quality control problems really should not have happened. It looks like you've also gotten some great prints along the way, since then, so you know that it can do a lot better - but 'spending more time fixing problems than printing' is absolutely NOT the sign of the Ultimaker owner experience. It really should just work, and fwiw, my own experience has been that it does. So it's not a fundamental flaw in the printer; just something that isn't right about yours, still. Firstly, regarding the firmware... the 14.1 firmware had another problem, so a few hours later, yet another update was put out, with a new version of the firmware. So, I'd be inclined to go download Cura yet again now, and install the firmware from that. Hopefully that will address all of the issues with aborting prints now. All the other problems seem to be related to the temperature of the hot end. I think we've probably mentioned in other threads that the fan on the back of the print head needs to run all the time. That would definitely be something to keep an eye on; that it runs, and keeps running, and there isn't any sort of intermittent connection problem. Other aspects of what you say - such as the head spitting out blobs of plastic sounds like the head may be getting much too hot. That could be a result of your print settings - what temp are you using? - but most likely its a some sort of temperature control issue. it might be an idea to go into the tune menu while printing, and see what sort of range the print head temperature experiences. Checking the wiring to the temperature sensor might be a good idea, also. What other sorts of print failures are you experiencing? I too am an expert at pulling apart the hot end, I've also been quite frustrated with my printer at times, though I've not had issues to the extent of yours. I'm mostly disappointed by the lack of consistency from one print to the next, and not having confidence to print anything taking more than a few hours for risk of failure. "I've had multiple clogs in the Teflon fitting and nozzle, which could only be unclogged by taking everything apart. (I have become quite efficient at doing this)." 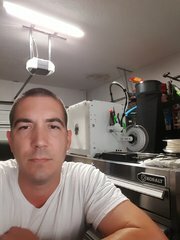 Posted January 12, 2014 · Multiple Issues, starting to get extremely frustrated with this printer! First let me say, thank you for all of your help and patience with my previous issues/posts. I have been dealing with heavy under extrusion issues. I have been adjusting the speed, temperature, and flow during prints when I start to see under extrusion taking over and always seem to get different results with inconsistencies. I wanted to wait until I had some more time to go over everything before posting back here. There are always entire layers missing in the print which makes it useless because I can just break it apart. I think I finally found the culprits to the majority of my issues. I say culprits because I believe I have had two problems the entire time. The first one is the spool holder that comes with the UM2. I believe the one that comes with the UM2 is a horrible design. I never thought it would actually be the reason for such issues. The second issue is with the netting that goes from the bottom of the extruder, up to the hot end. During prints it tends to move around and I noticed that the filament was rubbing up against the netting causing extra friction, along with the spool holder friction. These two simple issues have been haunting me for the past month. Since the spool was made I tried the same orange filament with multiple prints and it has worked flawlessly! I finally got my first glimpse of how this printer is supposed to work. I still need to do some more testing, but I have noticed a huge difference already. Interesting, thanks for the detailed post. Since I ordered a UM2 as well I am very interested to see how this all pans out. Are there any UM2 owners out there using the stock spool holder with good success? I'm glad you've been able to make some progress, Chrisp! The spool holder design looks really nice, too. I'll have to give that one a try. So far, I have been able to print a number of objects 4 times faster than before and they come out with the same quality as before. The same print that took 8 hours now takes me 1.5 hours. What a difference, I will post some pics soon.